To put this in perspective, understand that digirati spend roughly one out of every 4.5 minutes on social media and blogs based on Nielsen data. 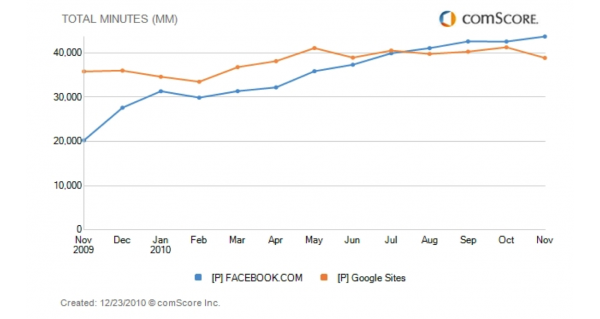 Last July, Facebook passed Google in terms of total minutes spent based on comScore’s data. Since time spent is often a proxy for engagement, this is critical tipping point. Of course, Google’s raison d’etre is minimizing the amount of time spent on Google because you’ve found the optimal answer to your questions. 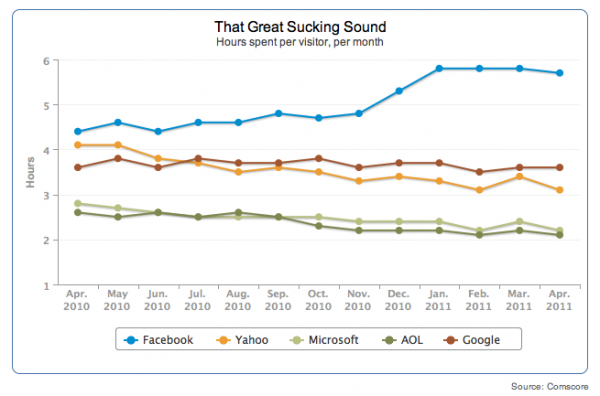 Further, during the first four months of 2011, time spent on Facebook was at least a third greater than Google followed by other content rich sites such as Yahoo, Microsoft and AOL. Combine these attributes with the wealth of information that Facebook has about its members and an expanded management team, it’s surprising that Facebook’s revenue model isn’t more robust and sophisticated. While it may seem a bit late to get into the social media game, especially if you’re looking at Facebook’s growing base and how it’s outpaced all other social media competitors, I doubt it. According to Inside Facebook, the social media platform has roughly 700 million users worldwide and is growing over 10 million users per month. Deeper examination, however, shows that the growth is attributable to adoption in newer regions such as Mexico, Brazil and India and offset by slight falloffs in the US, Canada and the UK. When it comes to jumping into the social media fray, as digital media’s relatively short history has shown, social media entities can quickly become marginalized and die when a new social media entity incorporating innovative and valuable new features comes along. Friendster or MySpace anyone? The bottom line is that it’s critical to be where participants are and spend their time. There’s a difference between engaged usage and generating pageviews regardless of whether you’re a media entity or a social media site. Google+’s greatest strength is how it takes seemingly disparate types of functionality and makes them all work together. Google+ has some really cool capabilities, integrating many of the features of other social media offering and appears to pose a strong challenge to Facebook’s seemingly unstoppable social media dominance. Over time, where Google will gain power is its ability (or not) to incorporate its disparate functionality that moves it from being a platform that sends users away to being a destination where users flock because it yields value beyond conversing with friends and playing games. What’s critical to understand is that Google isn’t just playing for social media dominance, it’s opening the walls of social media to create an integrated social business supported by its suite of free business tools, such as Google docs, Google voice and Google Analytics that keep information in the cloud. 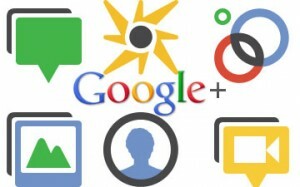 What’s your opinion of Google+ and the role that it will play? Stages of social media adoption. Tags Chart, Facebook, google+, googleplus. Bookmark the permalink. Thanks for this article, one of many great contributions you make.